Get Back (Issue #64), Honky Cat! If you’re like me (and if you read our stuff, I’m pretty sure you are), you fondly remember many of the great Bronze Age back-up features in DC’s comics. 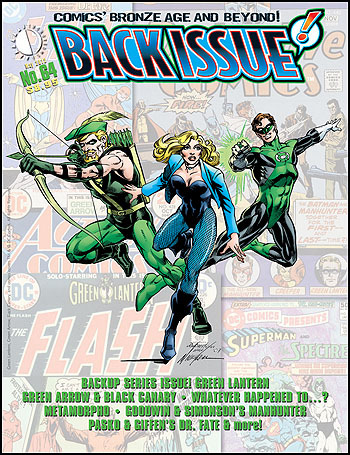 The latest BACK ISSUE (#64, shipping now) gives the lowdown on them, including Green Lantern, Green Arrow, Black Canary, Metamorpho, ARCHIE GOODWIN and WALTER SIMONSON’s Manhunter, MARTIN PASKO and KEITH GIFFEN’s Dr. Fate, “Whatever Happened To…?”, Nemesis, Rose and the Thorn, and the Seven Soldiers of Victory! Don’t miss editor Michael Eury’s latest, greatest issue, which is also in stores now. Or get the PRINT EDITION (at 15% off with a FREE digital edition) or DIGITAL EDITION ONLY (just $3.95) at this link. And heck, you know you want to subscribe and get every issue, so why not take the plunge at this link? This entry was posted in TNT on 25 April 2013 by Mr. Morrow. Two Eisner noms for TwoMorrows! A hearty congratulations goes out to Roy and his staff (Jim Amash, Chris Day, Bill Schelly, Michael T. Gilbert, and Paul Hamerlinck), and to Dewey Cassell and designer Scott Saavedra for their stellar work at making our company look so good! The award voting will take place soon, with the awards given out on Friday night of Comic-Con International: San Diego this July. This entry was posted in TNT on 16 April 2013 by Mr. Morrow.